The origin of the term "Eden", which in Hebrew means "delight", may lie with the Akkadian word edinu, which itself derives from the Sumerian term E.DIN. The Sumerian term means "plain" or "steppe", so the connection between the words may be coincidental, although this word is known to have been used by the Sumerians to refer to Mesopotamia as the "valley of E'din", meaning the fertile lands between the Tigris and Euphrates. 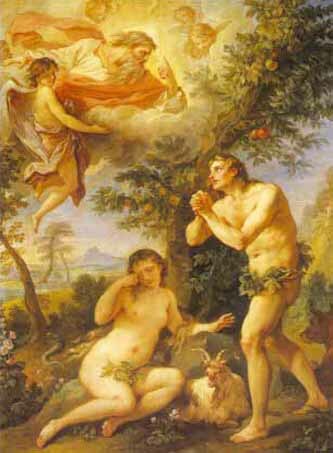 The Garden of Eden described in the Book of Genesis as being the place where the first man, Adam, and the first woman, Eve, lived after they were created by God. The past physical existence of this garden forms part of the creation belief of the Abrahamic religions. The creation story in Genesis relates the geographical location of both Eden and the garden to four major rivers (Pishon, Gihon, Hiddekel, Euphrates), as well as a number of named regions (Havilah, Cush, Asshur or Assyria) (see Genesis 2:10-14). This seems to suggest a setting in the ancient near east, specifically somewhere in or near Mesopotamia. However, because the identification of these rivers has been the subject of much controversy and speculation, a substantial consensus now exists that the knowledge of the location of Eden has been lost. There is yet no other indication found of its existence beyond the record found in Genesis and other early Judaeo-Christian literature, such as Jubilees. The text asserts that within the Garden the river divided into four branches: Tigris, Euphrates, Pishon and Gihon. The identity of the latter two rivers have been the subject of endless argument, but if the Garden of Eden had really been near the sources of the Tigris and the Euphrates, then the original narrators in the land of Canaan would have identified it as located generally in the Taurus Mountains. The Urantia Papers (1955) state that three locations were considered for the garden: The first was an island in the Persian Gulf; the second, the river location subsequently occupied as the second garden; the third, a long narrow peninsula - almost an island - projecting westward from the eastern shores of the Mediterranean Sea. The committee almost unanimously favored the third selection. The site chosen for the Garden was probably the most beautiful spot of its kind in all the world, and the climate was then ideal. Nowhere else was there a location which could have lent itself so perfectly to becoming such a paradise of botanic expression. In this rendezvous the cream of the civilization of Urantia was forgathering. Without and beyond, the world lay in darkness, ignorance, and savagery. Eden was the one bright spot on Urantia; it was naturally a dream of loveliness, and it soon became a poem of exquisite and perfected landscape glory. Satellite photos reveal two dry riverbeds flowing toward the Persian Gulf near where the Tigris and Euphrates also terminate. While that accounts for four rivers in the vicinity, that area is the mouth of those rivers rather than their source. In Isaac Asimov's Asimov's Guide to the Bible, he makes note that you should "Notice that it is not the garden itself which is called Eden. One cannot speak of 'Eden' as though it were synonymous with the Garden, any more than one can speak of 'California' as though it were synonymous with Yosemite Park." His words echo that of the Talmud written over 1,500 years before him which states (Brachos 34b) that the Garden is distinct from Eden. If the location of the original tellers of the tale is ignored, then there have been a number of claims as to the actual geographic location of the Garden of Eden, though none of these have much connection to the text of Genesis. Most put the Garden somewhere in the Middle East near Mesopotamia. Locations as diverse as Ethiopia, Java, the Seychelles, Brabant, and Bristol, Florida have all been proposed as locations for the garden. Many Christian theologians believe that the Garden never had a terrestrial existence, but was instead an adjunct to heaven as it became identified with Paradise. Others point out that the world of Eden's time was destroyed during Noah's Flood and it is therefore impossible to place the Garden anywhere in post-flood geography. There is also an attempt to tie this with the mystical sunken land of Atlantis. One favorite location is Sundaland which today is the South China Sea. In this case the current Tigris and Euphrates rivers are not the ones referred to in the narrative, but later rivers named after two of the earlier rivers, just as in more modern times colonists would name features of their new land after similar features in their homeland. This idea also resolves the apparent problem that the Bible describes the rivers as having a common source, which the current rivers do not. One recent claim by archaeologist David Rohl puts the garden in the north-western Iran. According to him, the Garden is a river valley east of the Sahand Mountain, near Tabriz. He cites several geological similarities with Biblical descriptions, and multiple linguistic parallels as proof. The Urantia Book (1955) places the Garden of Eden in a long narrow peninsula projecting westward from the eastern shores of the Mediterranean and having been long ago submerged in connection with volcanic activity and the submergence of a Sicilian land bridge to Africa, features unidentified by geologists. Recent exploratory efforts (2004) show promising signs of structures in the area east of Crete, where the Garden is believed to be submerged. Some of the historians working from within the cultural horizons of southernmost Sumer, where the earliest surviving source of the legend lies, point to the quite genuine Bronze Age entrepot of the island Dilmun (now Bahrain) in the Persian Gulf, described as 'the place where the sun rises' and 'the Land of the Living'. The setting of the Sumerian creation myth, Enuma Elish, has clear parallels with the Genesis narratives. After its actual decline, beginning about 1500 B.C., Dilmun developed such a reputation as a long-lost garden of exotic perfections that it appears to have influenced the story of the Garden of Eden. In a reverse process, literal-minded interpreters have sometimes tried to establish an Edenic garden at the trading-center of Dilmun. The first Sumerians lived in the plains of what is now southern Iraq. The Sumerian word for plain is "edin", and it is very likely that the name "Eden" has derived from this. Sumerian Gods create a biogenetic experiment. The word "paradise" that Christians have made a synonym for the Garden of Eden is a Persian word, which describes a walled orchard garden or an enclosed hunting park. It occurs three times in the Old Testament, significantly not in connection with Eden: in the Song of Solomon iv. 13: "Thy plants are an orchard of pomegranates, with pleasant fruits; camphire, with spikenard" ;Ecclesiastes ii. 5: "I made me gardens and orchards, and I planted trees in them of all kind of fruits";and in Nehemiah ii. 8: "And a letter unto Asaph the keeper of the king's orchard, that he may give me timber to make beams for the gates of the palace which appertained to the house, and for the wall of the city, and for the house that I shall enter into. And the king granted me, according to the good hand of my God upon me. ". In the Song of Solomon, it is clearly "garden;" in the second and third examples "park." In the post-Exilic apocalyptic literature and in the Talmud, "paradise" gains its associations with the Garden of Eden and its heavenly prototype. Literary Hellenistic influences led to the Pauline Christian association of "paradise" with the realm of the blest. The Greek Garden of the Hesperides influenced the Christian concept of the Garden of Eden, and by the 16th century, in the Cranach painting, only the action that takes place there identifies the setting as not the Garden of the Hesperides, with its golden fruit. Some anthropologists have hypothesized that the Garden of Eden does not represent a geographical place, but rather represents cultural memory of "simpler times", when Man lived off God's bounty (hunting and gathering) as opposed to toiling at agriculture... a metaphor reinforced by the words of the Book of Genesis. This is similar to the opinion of the Jews, who came up with the legend in the first place and should therefore be given some say, that Gan Eden exists on a purely spiritual dimension and is not part of our physical world. Eden is sometimes considered the Cradle of Humanity or the Cradle of Civilization. The Garden of Eden is a creation myth replete with symbolic content. The story is laced with metaphors for the reader to beli'eve', then to unravel, arriving at the truth behind the illusion. The obvious metaphors are male/female, duality, polarity of our experience in a bipolar electromagnetic experiment. We also find a link with ancient aliens and Sumerian Gods who came to Earth to create a biogenetic experiment called Humans. The serpent represents spiraling DNA or Dragon symbology. The fall represents consciousness slowing down as it spirals (falls) into the symbolic tree of life or physical experience/experiment from which it is about to evolve.